REMEMBER when Andrew Lansley went to the Royal Free Hospital in Hampstead back in March and refused to talk to the press? Away from the cheery official photoshoot pictures, the Health Secretary ended up being chased through the corridors as hecklers bust their way in. It was the latter that ended up dominating the reporting. That said a new report on ‘communications’ filed for the hospital’s board says the incident did not lead to any bad coverage – it led to only positive coverage and neutral coverage. In fact, according to the update in the quarterly reports, the visit was simply ‘a major source of neutral coverage’. Mr Lansley will be delighted. Given all of that, the hospital won’t mind a little link back to journalist Tom Foot’s New Journal piece in which he fairly describes the visit as a bit of a farce. What a crazy afternoon that was. When they say neutral, they mean neutral with respect to the Royal Free, and I think that’s fair enough. Lansley may have looked like a twerp, but I don’t think anyone blamed the hospital for it. 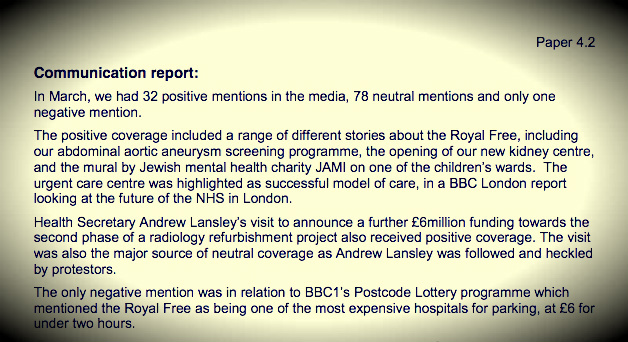 Cheers Tom, that’s true, the report is written from a Royal Free point of view, not an Andrew Lansley point of view. People may not blame the hospital – and of course they shouldn’t be, it was Lansley’s communications team that barred local press – but when things like this happen in an institution there is more than a small risk that people get a less than positive impression when they read about in the paper. Just through an unfortunate association.